Agulhas II with the EDEN ISS containers on the sea ice in Atka Bay. After being unloaded from the ship, the greenhouse containers were towed about 20 kilometres to the Neumayer Station III. The two greenhouse containers were placed on a pre-installed platform about 400 metres away from the Neumayer Station III. With the arrival and unloading of the EDEN ISS greenhouse at the edge of the Antarctic ice shelf, the construction process has begun. "We can hardly wait, as our four-person construction team set foot on the Antarctic continent before Christmas," says EDEN-ISS Project Manager Daniel Schubert. In the coming weeks, the team from the German Aerospace Center (Deutsches Zentrum für Luft- und Raumfahrt; DLR) will set up the greenhouse, designed for extreme environments, just 400 metres from the German Neumayer Station III in the Antarctic. It will be run by the Alfred Wegener Institute (AWI), which is working on the EDEN ISS project together with DLR. The Antarctic is the ideal test site for growing vegetables under artificial light and without soil in a sealed system, where all water is recycled and no pesticides or insecticides are required. The test will demonstrate the cultivation of crop plants in deserts, in areas on Earth with low temperatures, as well as for future manned missions to the Moon and Mars. The mission can be followed on Twitter, Facebook and Instagram via the hashtag #MadeInAntarctica. As the greenhouse was held up for a few days on its journey by sea, the DLR team experienced what it is like to spend Christmas and New Year's Eve in the light of the midnight Sun. "We spent Christmas in the station together with the AWI team,” says Schubert. "Standing on the roof of the station at night and enjoying the view was truly special. Even that late in the day you still have to use sunscreen as the Sun is still shining that strongly." As Universal Coordinated Time (UTC) applies to all of the 50 people living in Neumayer Station III, they welcomed the New Year one hour later than in Germany. "With the Sun above the horizon, it took us a few moments to realise that a new year, and an unbelievably exciting one for us, had started," said DLR researcher Paul Zabel, describing his impressions. "There were no fireworks, because they are not allowed in the Antarctic, but we all toasted to celebrate 2018 and our upcoming joint research." The researchers around Daniel Schubert, from the DLR Institute of Space Systems, do not have a lot of time to get the greenhouse, which is housed in containers, up and running. "Once the two container sections have been towed from the edge of the ice shelf to the station and assembled on the pre-installed framework, we have to make a quick start on the interior set-up," explains Schubert. "Shelving units have to be set up, pumps installed for the nutrient solution, and special LEDs calibrated for optimal lighting. Then, sowing will commence." Schubert and two of his colleagues, Conrad Zeidler and Matthew Bamsey, will embark on their return journey to Germany via Cape Town in the middle of February, when one of the last aircraft will be leaving Neumayer Station III. Zabel will remain behind during the Antarctic winter months to look after the plants. "If we sow punctually at the start of February, I hope to be able to harvest the first lettuce leaves and radishes at the end of March," says Zabel. From 21 May to 22 July, the Sun does not rise above the horizon in the area of Neumayer Station III, which lies at a latitude of around 70 degrees south, and temperatures can fall to less than minus 40 degrees Celsius. "Our menu will certainly be enriched when Paul adds fresh vegetables straight from the greenhouse to our food supplies," said Bernhard Gropp from AWI, who, from February 2018, will take over as station leader for the coming winter season. During the Antarctic winter of 2018, a team of 10 scientists, engineers, a cook and a doctor, will live on Neumayer Station III. "We are interested in seeing whether the fresh food will produce a positive psychological effect," said Gropp. In the Antarctic summer season, from November to February, supplies of fresh fruit, vegetables and lettuce arrive by air from South Africa every three to four weeks. The last delivery of fresh food reaches the station at the end of February. Up to now, this meant that no fresh lettuce, tomatoes or cucumbers were available until the following November. Initial plans are to run the EDEN ISS greenhouse until December 2018. Upon completion of trial operations at the DLR Institute of Space Systems in Bremen, the special greenhouse containers left the port of Hamburg on a cargo ship bound for Cape Town on 8 October 2017. 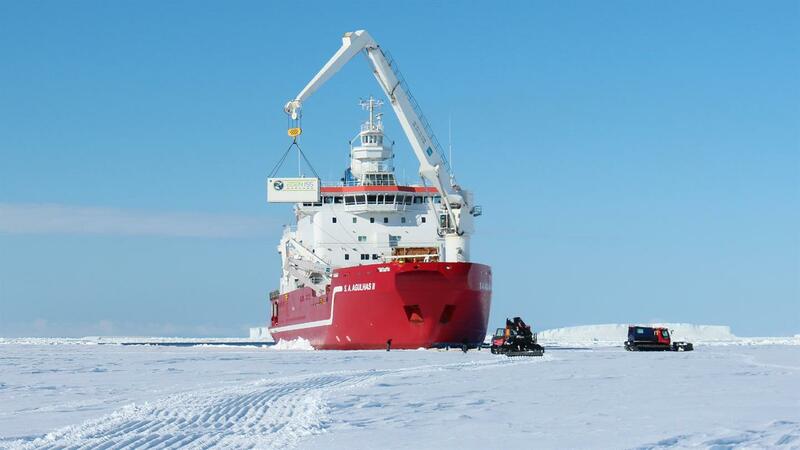 There, they were loaded onto a South African research ship on 3 January 2018, which reached the Antarctic Ekström Ice Shelf on 18 December. "We then towed the container greenhouse another 20 kilometres from the edge of the ice shelf to Neumayer Station III using tracked snow vehicles," reports Daniel Schubert. He and his EDEN ISS team colleagues initially arrived at the Russian Novolazarevskaya Station from Cape Town on 18 December, from where they flew on an AWI flight to the German Neumayer Station III on 21 December. Aeroponics is the magic word for the horticulture that is about to start under Antarctic conditions. Using this technology, plants are cultivated without soil in a sterile environment; their roots are sprayed with a computer-controlled water/nutrient mixture and the leaves receive the right amount of light using special LEDs. "We are also adapting the air in the greenhouse to meet the needs of the plants as much as possible. The carbon dioxide content is increased, and we clean the air of moulds and bacteria using special filters and sterilise the air with ultraviolet radiation, which means that purely biological growth is possible without insecticides or pesticides," explains Schubert." Just as in a space station, the greenhouse has a completely closed air recycling system, including an air-lock, through which Paul Zabel will enter the greenhouse every day. The closed air recycling system additionally allows all the water that the plants release into the air to be collected and fed back to them again.